The cosmos still offers up mysteries and surprises. And sometimes they sing to us – quite literally. This is sound, just not sound we can hear – some unexpected interaction of the comet with the magnetic field around it at inaudibly low levels. So, who you gonna call to allow people to easily hear patterns in the data? Why, a composer, of course. If composers of past centuries found expertise in adapting musical materials to acoustic instruments, the 21st Century finds compositional practice making magnetic data listenable – music, as it was centuries ago, a science inseparable from mathematics, physics, and the stars. Just how low is this bass line? Think 40-50 millihertz – yeah, “milli-“. Your subwoofer isn’t exactly going to handle that. So, instead, the sounds are reproduced at a factor of 10,000. And here’s the sonification on SoundCloud. It’s Creative Commons-licensed, so you can use it in your own work. (Do note the non-commercial and share-alike restrictions.) And of course you can comment “Where’s the drop?” on the audio, too. What I find striking about this is that the sound is just as compelling as a visualization to represent the pattern of the data in this case. That’s a real challenge in sonification, but here “song” is exactly the right metaphor. This isn’t an arbitrary translation into sonic patterns; it really is a magnetic oscillation to begin with. Read more about the project on the European Space Agency [ESA] blog. And kudos to the European Space Agency for sharing beautiful imagery and sounds. We’ve communicating with both ESA and America’s NASA your desire for this kind of media and creative interaction. There’s more, too. Our generation’s “one small step for man” moment, you can sample (Share Alike) the thump of the lander on the comet it just harpooned. We live in wonderful times. 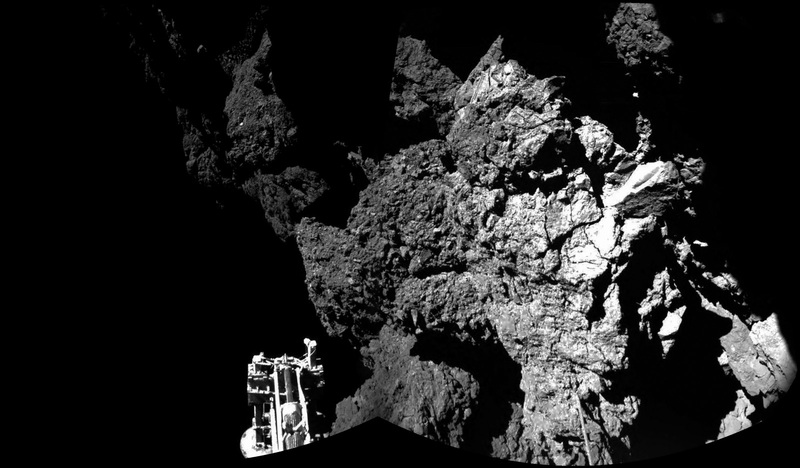 Photo, top: ESA/Rosetta/NAVCAM – CC BY-SA IGO 3.0.